Storey Publishing, LLC, 9781635860948, 192pp. People have been retreating to the woods for quiet, meditation, and inspiration for centuries, and recent research finds that time spent in the forest doesn’t just feel good but is, in fact, good for you. 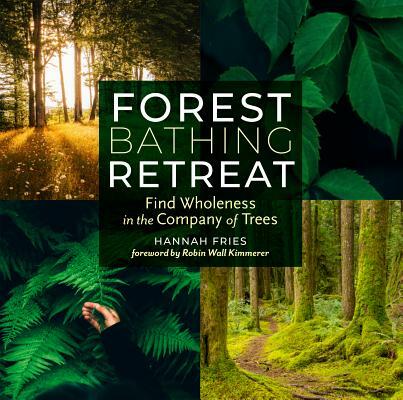 Inspired by the Japanese concept of shinrin-yoku, or forest bathing, poet Hannah Fries invites readers to bask in the company of trees, whether in a city park or a rural nature preserve. Fries combines her own reflections and guided mindfulness exercises with a curated selection of inspirational writing from poets, naturalists, artists, scientists, and thinkers throughout the centuries and across cultures, including Japanese haiku masters, nineteenth-century European Romantics, American Transcendentalists, and contemporary environmentalists. Accompanied by beautiful forest photography, Forest Bathing Retreat is a distinctive gift that invites frequent revisiting for fresh insights and inspiration. Hannah Fries is an award-winning poet, writer, and editor whose work has been featured in numerous publications including Orion, American Poetry Review, Massachusetts Review, and Alaska Quarterly Review. Her first book of poetry, Little Terrarium, was published in 2016 by Hedgerow Books. Her work has been nominated for the Pushcart Prize, and she was awarded a scholarship from the Bread Loaf Writers’ Conference. A native of New Hampshire, Fries is a graduate of Dartmouth College and holds an MFA in poetry from Warren Wilson College. She lives in the woods of western Massachusetts. Robin Wall Kimmerer is the State University of New York Distinguished Teaching Professor at the SUNY College of Environmental Science and Forestry in Syracuse. She is founding director of the Center for Native Peoples and the Environment. Her books include Gathering Moss: A Natural and Cultural History of Mosses and Braiding Sweetgrass: Indigenous Wisdom, Scientific Knowledge, and the Teachings of Plants.